Notre Dame University Bangladesh (NDUB) Deputy Controller of Examinations Dr Br Leo J Pereira, CSC, second right, distributes prizes among the winners during Inter-University Basketball Tournament at NDUB campus premises on Saturday. 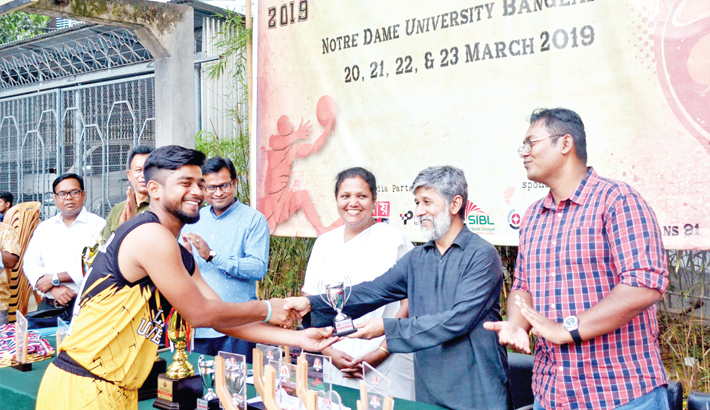 Father Benjamin Inter-University Basketball Tournament 2019, organised by Notre Dame University Bangladesh (NDUB) was held at the university campus premises on Saturday. The four day-long basketball tournament inaugurated amid gala opening ceremony on March 20. Islamic University emerged as the champions beating Independent University, Bangladesh in the final on Saturday. NDUB clinched the second runners-up in the meet. NDUB Deputy Controller of Examinations Dr Br Leo J Pereira, CSC distributed prizes among the winners as the chief guest. Student Affairs Asst Director Sr Shagorica Maria Gomes, CSC, English Department Asst Professor Sk Rezwan Shihab, Law Department Lecturer Md Mustakimur Rahman were present during the concluding ceremony. A total of 11 renowned universities took part in the inter-university basketball tournament, namely —- Dhaka University, Jahangirnagar University, Islamic University, North South University, BRAC University, East West University, Independent University Bangladesh, American International University-Bangladesh, Bangladesh University of Professionals, Islamic University of Technology and hosts Notre Dame University Bangladesh.